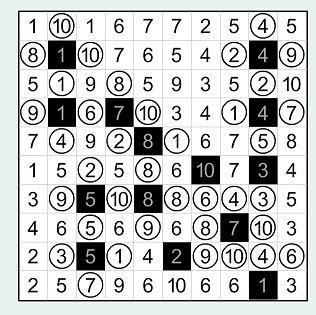 Status: offline If you see any solved Hitori, the black squares are always connected diagonally with another black square, and this with another and so on until they reach one of the sides of the puzzle. Nothing like "island black squares", but the rules don't say anything about this. Why is this happening? What is the math behind this? Status: offline This has gone a long time without an answer. I'm not a puzzle creator, but I can speculate on why puzzles are constructed this way. I believe that it has to do with the rule that a mark cannot divide the grid. The long chains create opportunities where the solver has to decide which of two cells in one row or column need to be marked and they find that one of them must be left open because filling it in would connect a pair of those long chains and divide the puzzle. If all of the cells were disconnected throughout the puzzle, then that rule wouldn't come into play in solving it. And given that this rule is one of the more abstract rules that requires a more global awareness of the entire grid in order to apply, it is thus a popular one to use to make the puzzles harder to solve. Status: offline Flarbear's response doesn't seem correct to me. There cannot be any "loops" in the puzzle or the puzzle becomes unsolvable. Picture a puzzle that you are solving and you've reached a point where you only have 2 squares left to decide whether they are black or not. These two squares, if left clear would form the loop around a group of black squares, as Vitol is asking about. In that case, you could never solve the puzzle because either one of those squares "could" be black and the other clear and the puzzle would still be "solved correctly". Any disconnected group of black squares, not connected to any edge of the puzzle, would necessarily allow multiple solutions to the puzzle. Status: offline That's an interesting example. It's hard to say whether it is valid or not since the rest of the puzzle is unsolvable. But as a concept, I cannot immediately see any reason why that shouldn't work. Status: offline I'm not sure this last puzzle actually works. When I was solving it there was a "flash" when I clicked on a centrally located nine (row 6, column 7). I'm thinking that means it is an error, but I might be wrong. If I continue and "solve" the puzzle it doesn't show that it is completed. I'm not sure this last puzzle actually works. When I was solving it there was a "flash" when I clicked on a centrally located nine (row 6, column 7). I'm thinking that means it is an error, but I might be wrong. If I continue and "solve" the puzzle it doesn't show that it is completed. That flash was (most likely) the game telling you that you solved it. 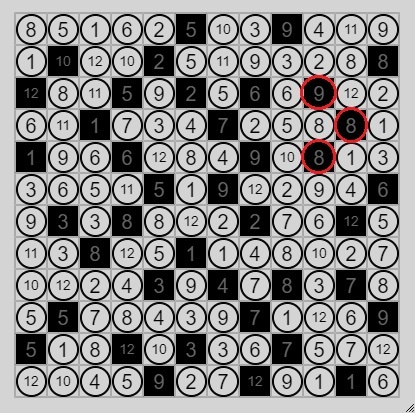 If the site is checking only for the correct squares marked black, and considers the circled squares irrelevant to the solution, then clicking on the 9 as the last black square solved the puzzle and gave you the flash. I haven't played much with Singles there (their name for Hitori), but I know other puzzles on that site use the flash to indicate a correctly solved puzzle. EDIT: Just tried it. I got the flash when I clicked on the last black square, a 5 for me, while I still had 2 other squares that would be circles but were not yet marked. The rules state "Black out some of the squares, in such a way that...". The puzzle is solved when the last black square is marked correctly. Status: offline As for the original question, perhaps the algorithm that Conceptis uses to generate Hitori puzzles doesn't allow for islands, even though they are legal and possible (as was just proven by sslug).